When I need a pick-me-up, or just want to have a warm and fuzzy feeling inside, I put on my holiday playlist of a measly 300 songs. It might seem odd, because although a lot of people enjoy holiday tunes, they tend to only want to listen to it one month out of the year, two at max. But I can really start getting into it in September most years, though I did hold out until October this year (no one congratulated me). I started this habit in college. I wasn’t even ill then, just extremely stressed out. It would annoy my friends and family (still does) but I really didn’t care. I could sing and hum my way through “Sleigh Ride” and nothing was going to stop me. When the chronic illness came, something else came with it: stress. So of course I took my coping mechanism from before and applied it to what I experience now. Who doesn’t like to imagine themselves walking in a winter wonderland? Or sitting by a delightful fire? Or even hearing those sleigh bells jingling ring ting tingling too? They all elicit enjoyable memories for me; yearly gatherings of friends and family, playing in the snow, ringing a bell to raise money for the homeless, making gifts and writing cards for my favorite people, and being a wide-eyed 5-year-old opening a Barbie that was my size on Christmas day sent all the way across the country from Grandma and Grandpa. And even though I may have been a little zombie-ish through the last few holiday seasons, I still appreciate the good memories and still find joy in the more current ones. 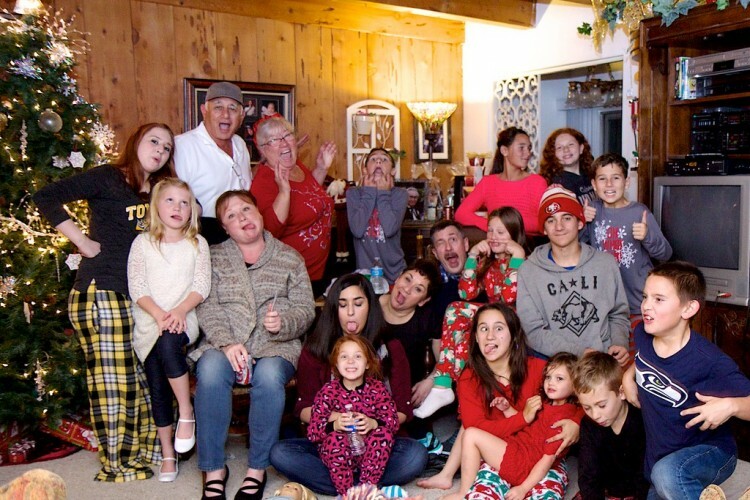 Bradley (center, seated) and her family on Christmas Eve.